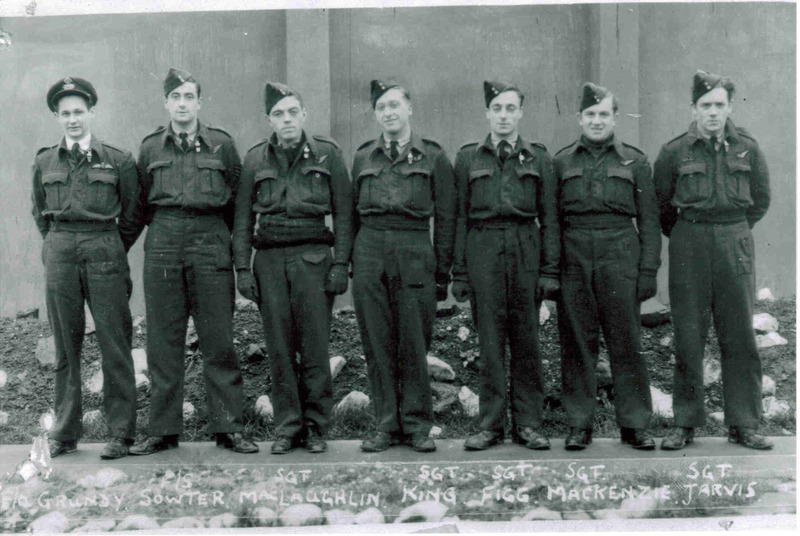 F/Sgt Figg, F/O Grundy, WO2 McLauchlan and Sgt King were confined in Hospital due injuries until Liberation. Sgt King, on repatriation, was admitted to RAF Hospital Wroughton where he received treatment for a badly broken ankle. WO2 Sowter was killed as he left the stricken Lancaster. He is buried, together with both Air Gunners, in Durnbach War Cemetery. Information concerning the loss of the aircraft from Canadian archives has been received on the web-site. This gives the area where the aircraft was downed and the location of the initial graves of the three dead air-men before their bodies were finally laid to rest in Durnbach Cemetery. The report shows that the aircraft went down in EUTINGEN IM GÄU (Schwarzwald) near Horb am Neckar and that Sgt MacKenzie and Sgt Jarvis were initially buried in EUTINGEN cemetery and P/O Sowter in BILDECHINGEN cemetery. Combined with night-fighter records from the German archives the conclusion is that LM273 was shot down on the homeward route over the Schwarzwald (Black Forest) by Oberfähnrich (Obfhr) Helmut Bunje 4./NJG 6. LM273 was one of three Bombers which he downed during that night. Peter Spoden, Bunje's commander in 1945, also had claims for that night but the available evidence rules him out, leaving Bunje as the pilot most likely to have claimed LM273 that night. It is likely that LM273 was his last claim which he made at 20.30 hrs combat time in the Freudenstadt area. This 550 Squadron aircraft was also the last one downed by a night-fighter during this night. The crash site is recorded as the village of EUTINGEN, where the Bürgermeister reported a four engined aircraft crashing in flames at about 9 o'clock on the evening of 23/02/1945 in a field 2km south of the village. One body was discovered in the wreakage, one 100m away and a third near the village of BILDECHINGEN. He also reported the capture of one crew member at MUEHLEN, two in EUTINGEN and one captured wounded in GUETTELFINGEN. The two bodies near the aircraft were buried in one grave in EUTINGEN by French and Belgium PoWs. A visit to the scene of the crash by the investigation team revealed three Merlin engines remained in the field. Many thanks to Jörg Helbig for granting permission to publish the results of his researches on this aircraft. Gemeinde Bildechingen, Bürgermeister, 7 January 1946. Record of Roy Sowter burial in Friedhof Bildechingen. The document records "parachute crash" as cause of death. The pilot F/O Grundy (in one of the other documents) records that Roy Sowter was ready to leave right behind him, but insisted he leave first, and that the plane hit the ground in a slow shallow dive so that the Navigator did have time to bale out. So perhaps there was a parachute failure. The following documents have recently been received from the Bürgermeisteramt, Eutingen im Gäu. Many thanks to the staff there for making them available.